Leviathan was suggested to my seven year old recently, though. 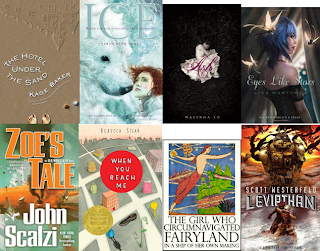 I've read several as well, and I'm quite excited by the nominees this year. Under my belt are ASH, EYES LIKE STARS, ZOE'S TALE, THE WINDUP GIRL, THE LOVE WE SHARE WITHOUT KNOWING (excellent book), and BONESHAKER. I have but haven't read LEVIATHAN and THE CITY & THE CITY. If you're curious about ICE, a friend of mine posted a review in her LJ (her LJ is pretty much nothing but reviews lately, I highly recommend her). I'm curious about When You Reach Me since I thought it won the Newberry Medal for Children's Literature? I'm not familiar with it and don't know whether it can serve as a YA title or not. Since you posted the link to the Valente ebook/audio book I started listening to it. I like the concept so far but I don't know how long I can listen to it/read it on a bright screen. I'm sad it isn't out in book form yet. Honestly, I'm pretty surprised Flesh and Fire was nominated. I read it quite awhile ago and remember not being all that impressed. 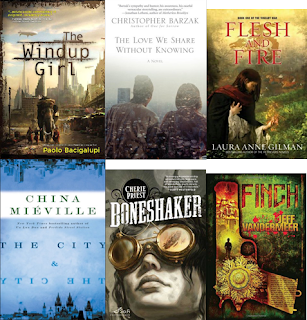 I also read: Boneshaker, Ash, Leviathan--and I like them all. @Letter4no1: I'm with you there. I don't have the visual endurance to expose my eyes to a computer screen for as long as I can sit and read a physical book. As soon as it hits traditional bookshelves, I'll be one of the first to pick it up. As of right now, I have to pass on the current format. My review for Flesh and Fire. I really have no excuse for not having read The Windup Girl yet. I shall fix that very soon! @TJ: Thank you for the link! In light of the award nominees, I'll be putting Shriek, and Finch near the top of my reading schedule!